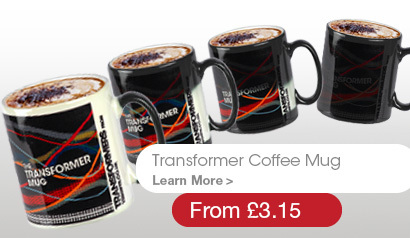 Our promotional coffee mugs are synonymous with high-quality luxuries. As all coffee drinkers can tell you, a favorite mug is chosen for daily use through looks, the weight or feel of the item, and the ability of the mug to stand up to rigorous use. The hundreds of styles of mug that we offer are all made of top-rate materials, ensuring your mug will be the first choice for every prospective customer. Coffee mugs come in a very wide variety of colors, shapes, and styles to reflect any corporate message. It is important when choosing promotional coffee mugs that your perfectly capture your brand identity whilst being attractive and eye-catching; the wide range we have at Yes Gifts means we have something to suit everyone. Promotional coffee mugs are a sure bet as an advertising aide; their longevity and great print area means they are a brilliant way to convey your message to your customers for months and years to come. Cost effective promotional coffee mugs are not always limited to use for drinks either. They will stand on desktops holding flowers or confectionary, used to collect money for charity or even used as paperweights or pen holders on a regular basis.